The first thing I learned to draw with a pencil was a human head – a woman with her hair up, Victorian-style, although I never did quite get it right where the head joins on to a body. 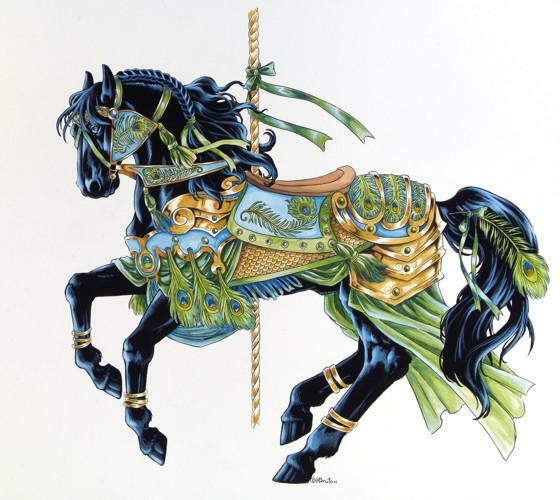 Then the second image was the profile of a horse. It’s so easy, so stylised, that wonderful curve of jaw and arc of mane. 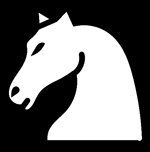 At its simplest it’s a chess knight – but let’s hold our horses, as that iconic form may lead to a whole other blog post. Here I am looking at that other beautifully seductive form – the carousel horse. I always wanted to ride on one but I very rarely had the chance. Instead I was always persuaded to spend fairground time shying at coconuts and throwing ping-bong balls into goldfish bowls. What’s the attraction of the carousel horse? Apart from the obvious My Little Pony aspect? Maybe it’s because you are galloping along on a beautiful horse with hypnotic piping organ music, apparently going faster and faster and getting dizzy with delight… But the sense of freedom is an illusion – in the end you are tethered, having ups and downs but in the end you are just going around in circles. A bit like life, really? 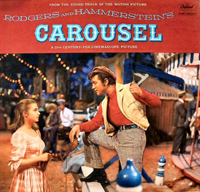 Which is no doubt why the carousel was the central image of the Rodgers & Hammerstein musical (and film) of the same name, set in newly industrialised New England in the 1870s and all about life and death and love. Some great songs, such as You’ll Never Walk Alone. I cry every time. Fairgrounds and amusement arcades always have that certain feeling of danger attached to them. In the USA it’s “the carny” (carnival), in the UK funfairs are traditionally associated with travelling folk and gypsies. Because they come and go they are “outsiders” and for this reason they make settled people nervous and are often blamed for thefts and crimes in the area during their brief stays. Cher’s Gypsies, Tramps and Thieves ring a bell? Please click on the pictures to go to the original sources of the images. Carousel comes from the French carrousel but originally the Spanish carosella, meaning “little battle”, as originally it was a cavalry training device with riders suspended in baskets around a central pole. There’s lots more about that on Wikipedia. The idea developed into an amusement ride with “flying horses” suspended from a central pillar and flung out by its rotation. But the music-accompanied steam-powered rotating platforms we know and love as carousels today date from about the middle of the 19th century. Eventually the machinery evolved to enable the up-and-down movement of the horses on their own barley-sugar brass poles. Early carousels and most modern American carousels have nothing but horses, so are often called gallopers. In the UK it’s more common to have an assortment of animals real and mythical and chairs or sleds as well, although these don’t go up and down. In the UK we tend to call them merry-go-rounds or even roundabouts (although that name often refers to much smaller push-around rides in playgrounds). Here are a selection of standard, but colourful, carousel horses. And then what about carousel unicorns? 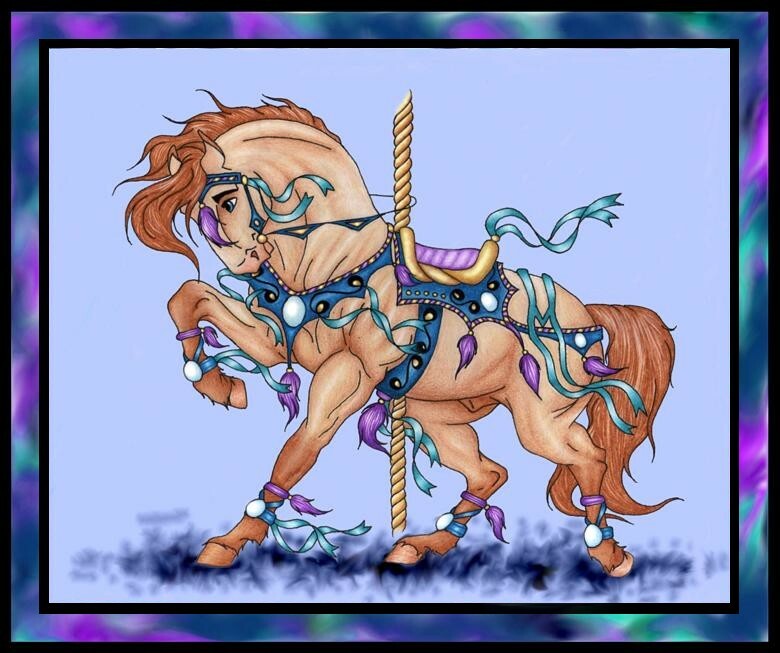 An ethereal carousel unicorn by Beltane Egyptian for Deviant Art - no way could you ride on the back of this one! Thanks so much for featuring one of my photos! I like the article and hope you will be able to get to a fair soon and take a twirl on a roundabout. Thanks again. Well, thank you for not minding my using one of your pictures – it was a very lovely and colourful one! Interesting – even puzzling, considering carousels are for children – to see how many horses here either mimic the stance of the destrier (the stances and movements of dressage, which they also resemble, are also based upon those of the destrier, but far more formalised), or actually are scaled-down deptictions of the armoured war-horse itself – those with the head spikes, particularly. The spike, rather than to emulate a unicorn, was actually functional, as armoured knight and armoured horse fought as a unit, both equally lethal. This is demonstrated, again, in the large, prominent, teeth of the armoured horses – this is not a friendly grin . . . The Euro Disney King Horse, of all the carousel destrier-types here, has the only authentic saddle, the high cantle (at the rear), being designed to keep the rider in place in the even of a frontal impact**. The historical accuracy suggests (to me at least), that this horse is probably French in origin, or in design, at least. **It also makes a great deal of sense in terms of keeping little kids in place. Thanks for dropping in to comment, Ron. Hope you are feeling brighter now Christmas is over (and the snow). I think you said you felt a bit low a week or two ago. Have a good 2011. As for the carousel horses, you know, it never crossed my mind that they were for children! Interesting that you mention armour – I’ve always loved arms and armour and had a little notebook in which I drew various sorts. By the way, have you seen this squirrel armour? You’ll either like it or hate it – could go either way! Completely forgot about your blog – I’ve been very ill since just before Christmas, and only now getting back slowly to some sort of normality (the post that said normal service was about to be resumed was just a tad over-optimistic). I’ve been a lot worse since then; I seem to have picked up a bug which makes me feel appallingly ill, without providing any objective symptoms, other that a temperature of 102F, that I could take to a doctor. Not even a sniffle. Anyway, the simplest way to put extracts from your posts on the home page and in subscribers’ emails is to use the “read more” tag. In the New Post pane it’s the fourth from the right on the top row of the main buttons, immediately left of the spell-check button (looks like a page-break symbol). Just insert the cursor at a point in the post which should encourage people to read on, then click the button. That displays the post up to the cut-off point, and inserts a “Continue Reading” link. You can see how it works on my home page. Mind you, my posts tend to be more text-heavy than yours, which makes it easy to find a good lead-in word . . . Some themes will allow you to create hand-crafted excerpts, rather than just a snippet from the beginning (you can see the box on the New Post page). At least that’s the answer when the question has been asked in the forums, but I’ve just searched for themes that allow excerpts, and there seems to be only Hemingway (white text on a black ground – which should be a crime against blogging). Static pages are a no-no. Google loves new content, and will stop seeing a static page quite quickly. I know you said page rankings don’t matter much to you, but they actually do for someone trying to find you on Google. Type in carousel horses and see how deep you have to dig to find your post. OK, if you add +squirrelbasket to the search string, it’ll pop right up, but you need to attract people who are looking at carousel horses, not just those who know you’re there. Great, thanks for that advice – glad I asked instead of trying for myself, as I thought that “hand-crafted excerpts” bit was the one I needed. I’m not keen on changing my theme, as this one works for me – although I may change the pic at the top eventually. So that “more” button was staring me in the face all along. And I was just being defensive about page rankings when I said I didn’t care! Of course I do, but you caught me at a down moment. Oh, I love this post of beautiful carousel horses. We have a gorgeous carousel in the middle of Central Park, where my friend and I used to go, even as teenagers, to ride and ride. When we were little, we would fantasize about hiding out and being locked into the carousel shed. At night, of course, the horses come alive. But everyone knows that! I’m afraid I don’t have the copyright. The picture is by the wonderful Heather Bruton. If you go to this link: http://www.deviantart.com/art/Peacock-Carousel-Horse-21529368 you could perhaps leave a comment and ask her? Best of luck with your store – come back here and leave another comment with a link if you have a website! Ever so glad you find something of interest in the blog! And I admire the brightly-painted water-powered carousel horses you have linked to – I see they are made for two people to ride.